What constitutes 'art ' and What is 'craft' ? Craft is essentially the production of an item that requires skill to produce it. This makes most 'art' craft......Does it make craft 'art'? A never-ending discourse that will, one suspects, continue to be heatedly debated for all time! A lot of the argument arises because, in the initial dialogue, Westerners decided that Africa had no 'art' as they knew it which was primarily based upon painting and representational art. Instead, African painting consisted of decorating surfaces like rock faces, hides, bark, pottery, mud huts, sculptures and human bodies. 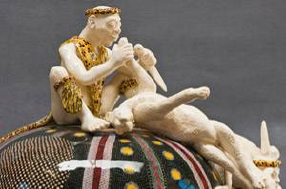 Africa had functional and utilitarian craft along with textiles, fetishes, idols and cultural artifacts. Within their own communities they were valued for everything that their African craft represented which was not just visual; their symbolism and spiritual dimensions alongside their decorative and aesthetic qualities. Master craftsmen and women had special status within societies and were respected members of their communities. Expertise and traditional skills were revered and coveted. Unfortunately, artist's names are often not known, were not recorded when the objects of their creativity were initially collected and preserved. Studying African craft allows us to look at issues of cultural identity and history as well as aesthetics; all topics that are relevant in contemporary craft as much as in traditional craft. Different areas and tribes produce divergent African craft according to tradition, availability of raw materials and historical influences. The movement of tribes and the trade they undertook can be seen on the embellishment of product with beads and other adornment of headwear, dolls and cloths. 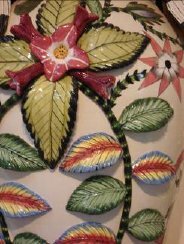 Stylizing of the patterning and sculptural forms on pottery provide a glimpse of how new influences and the arrival of new cultures impacted on traditional tribal areas. African craft is often associated with the production of utilitarian objects but it is essentially about beauty, sometimes in its humblest and possibly purest form. This is especially true of pottery where along with appreciation of perfect form, the technical skill of crafting can also be admired especially in the absence of even the simplest of machines like a potter's wheel. 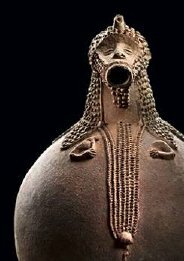 Ancient African artists believed that they had access to a certain pool of higher thoughts, said to be the origin of creation and that a man's hands were only tools used to reflect some of the magnificence he could occasionally have fleeting sight of. Such a fundamental core belief can only take a humble craft to another realm where a different evaluation system needs to occur. If there is any of this abiding belief left still inherent and I believe there is, then we need to recognize that for African cultures still producing craft today, there is no separation between art and craft; that they are as one because of the innate and instinctive nature of the creator and good craft will have enduring and transcendent qualities. One of the many challenges facing Africa today is how to keep it's indigenous crafts alive while embracing the techno logicalities of the First World in a way that serves the communities best and keeps their traditions alive. In 1939 in Lagos in what was then known as West Africa, HV Meyerowitz, artist and teacher, persuaded the then governors to start an Institute of West African Arts, Industries and Social Sciences, which would be a "marriage of aesthetic skill and power, to modern technique". It would investigate local arts and crafts, teach certain African crafts in the light of European experience and create local craft industries. It would also investigate local history, tribal life, customs, religion and economic conditions. In general it was a noble idea with good intent and a recognition that it was crucial to have an integrated societal system, melding the two cultures. Its downfall came in the simple terminology 'in the light of European experience'. A resultant pottery studio led by Meyerowitz and subsequently Michael Cardew failed dismally because not enough attention was paid to the motivation of the educated and skilled African employees. They did not see the sense of producing goods purely for resale; a creative piece however humble, always had a dual purpose, to be of use and to convey a spiritual message. 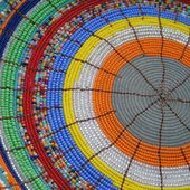 Esteemed poet and artist, Amadou Hampate Ba from Mali had this to say about his kinfolk: "The work of art, whatever form it takes, is viewed by traditional Africans as a porthole through which one can contemplate the infinite horizon of the universe". 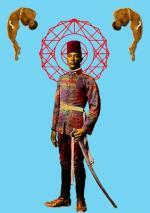 How to adapt a concept as large as this to meaningful craft production to all concerned with African art today? This is our challenge and our very great opportunity. In general, I believe we need to move closer to the ways in which traditional Africans observe their artifacts; we need to examine the principles behind the creation and production of African craft. The gap that Westerners perceive exists between art and craft will narrow and they will be seen as indeterminable in the end. For art is often well crafted and craft becomes art through the eye of the beholder should he see something in it that takes him beyond himself. While originating communities made no distinctions between art and craft, these days in a thriving cultural atmosphere in Africa and an upsurge in interest in Contemporary African art, 'African craft' has catapulted into 'art'. Beauty of form has become an overriding factor, mastery of technique essential and originality and innovation, key in production. Just as crafted items in the past were indicators of identity, status and wealth, so they are today and craft can collect huge prices in the art market. One can argue thus that our use of the term 'art' is thus based simply upon supply and demand. It is essential that art collectors and investors feel they are getting something exotic, original and limited in number. There are way too many highly successful operatives flourishing in Africa today to even begin to record in any meaningful way. The studio initiative below is an example of a very effective organization and is the first of many I hope to write about in the future that I have either had personal contact with or admire hugely. They are endeavoring to practice under enlightened conditions and I'm sure if one evaluated their success we would find common threads to their successful existence: I will be examining this in detail in subsequent pages. Ardmore was formed in 1985 out of necessity when Fee Halsted, a lecturer with Durban Technikon was retrenched and needed to make a living. She formed an association with Bonnie Ntshalintshali, a young woman who lived in the Drakensburg mountains where Fee resided. Together they started to produce decorative and narrative works which they sold from their studio in the Drakensburg mountains. In 1990 they jointly won the prestigious Standard Bank award for young artists and at this point, the Ardmore that we know today was recognised for its contribution to African art. 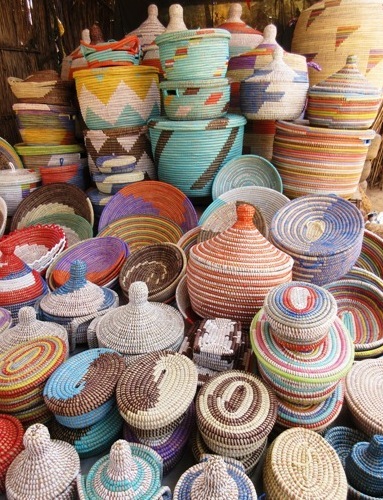 This is African craft that is undeniably 'art'. The ceramic pieces can be functional but essentially they are studio works to be admired and collected and indeed they are the world over. In fact, a magnificent piece created in 2000 by Wonderboy Nxumalo, one of Ardmore's artists, achieved a record price at auction with Stephan Welz in 2008, selling for R201 600. Its estimate was R30 000-35 000. Ardmore is a true co-operative and as Fee Halsted says 'we are because of others'. When a new artist joins the studio, part of their training is to pass an exam that includes learning the history of the workshop. This is to ensure the legacy of what they are about to contribute to, is carried forward in recognition for those that have passed on. Ardmore has sadly lost many artists to HIV including Bonnie whose work and life is honoured in the Bonnie Ntshalintshali museum on the property. Many of the artists courageously tackle their status and their art head on, producing works that do not shy from their subject matter. A fund exists which receives 6% of sale profits and has social benefits for all members. The artists often work in pairs, one sculpting and another painting. 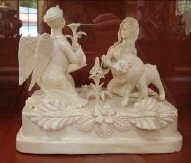 Although this is not one hundred percent the case, most often it is the men who sculpt and the women who add the decorative detail in paint. The artists at Ardmore follow their feelings and their instincts, although they are motivated by all sorts of influences that exist beyond the walls of this property and its gentle landscape. Whatever appeals, you will be sure to find something that you will respond to in this truly inspirational place. It embraces creativity and responsibility, teaching ownership in more ways than one. 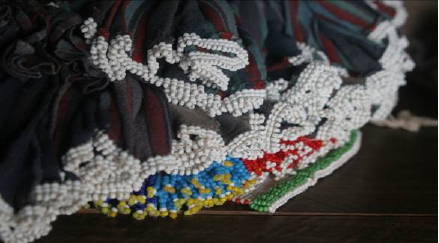 Artists like Nhlanhla Nsundwane are true to their traditional Zulu life. I personally love this hard sculptural work seen above, created by Petros Gumbi, for its authenticity, wit and flair. 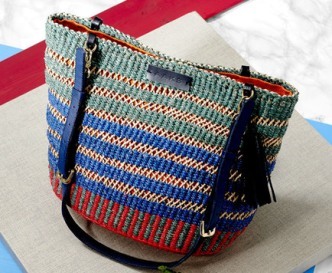 Handcrafted women's accessory bags are designed by Akosua Afriyie-Kumi and produced and woven in the village co-operatives of Northern Ghana. Using raffia as a fibre they also have leather handles and tassels and buckles. They are extremely colourful and hard-wearing with a tight weave and a quality finish to the product.